Personality: Daemon is somewhat comical, adding a bit of levity to situations that are otherwise serious. He has a flippant attitude under normal circumstances and seems to like annoying his students which usually earns him a slash from one of one of their weapons. He also appears to have a history of referring to cute girls he meets as his 'first love', complete with a deadpan look on his face despite the obvious lie. He also apparently enjoys listening to jazz music, as he had a phonograph that played his vinyl records. Underneath this, though, he is quite perceptive in terms of regarding other people. Whenever angered or in combat, Daemon is fairly calm, serious, and level-headed. Whenever he uses his abilities during battle, the pupil within his eyes changes shape. Daemons scythe is a product of the sands illusion capabilities. 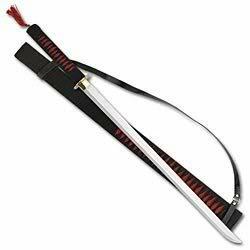 His sword looks like a normal katana but due to Sabbia Eterna, its now black with red like markings on the hilt. 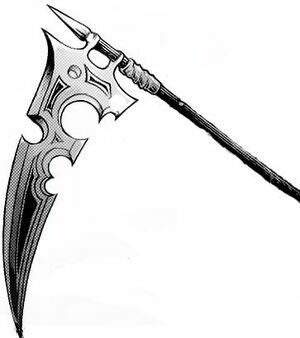 Demonic Attributes He has the ability to turn his body into sand thanks to his scythe known as Sabbia Eterna. The sand also allows Daemon to create illusions, due to the capabilities of the sand. Abilities: His main ability is to turns his body into sand. He can also create illusions for easy getaways. Daemon was born in True Cross Town to two unknown illusionists. They raised him in the town using demons to help in training his illusionist abilities. During one of the training sessions, he was attacked by a demon, wounding both of his eyes. After he had awoken he learned when he uses his abilities his eyes change and gain a spade like image within them. He also learned that with the scythe he obtained from his father during on of the sessions, he can turn his body into sand. After learning this he decided to go to True Cross Academy, where he was accepted due to his good grades and excellent way of showing his abilities off. He was then made a Middle First Class so he could help teach the new students within the academy. Daemon sat behind the large desk at the front of the room. He set his suitcase on the floor beside him. Within it was what he was going to teach to the class today, but hardly anyone was here and the ones who were currently here, were sleeping and not paying attention. He picked up his suitcase and opened it quickly. Pulling out a vial of a demons blood from within its compounds. He looked at everyone, who was now eyeballing him for the vial. He slowly opened it, letting a drop of it hit his desk. Suddenly many demons appeared within the room. "Your current assignment is to defeat these demons" He said to the class as he leaned against the wall. He wasn't going to get into this unless something bad was about to happen to the class.